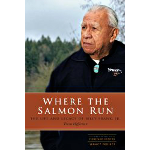 The Life and Legacy of Billy Frank Jr.: In Hardcover And Paperback, Or On Kindle: an early participant in the fight for tribal fishing rights during the 1960s. Roughed up, belittled, and arrested many times at Frank's Landing on the Nisqually River, he emerged as one of the most influential Northwest Indians in modern history. His efforts helped lead to U.S. v. Washington in 1974, in which U.S. District Judge George H. Boldt affirmed Northwest tribal fishing rights and allocated half the harvestable catch to the tribes.